The ASSESS-HKH consortium comprises six Asian partners from the Hindu Kush-Himalayan region, i. e. country partners from Bangladesh, Bhutan, India, Nepal, Pakistan and the international organisation ICIMOD located in Kathmandu, Nepal. 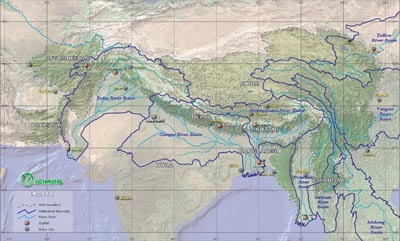 Geology, geography, climate, and hydrology vary noticeable within the HKH region and exhibit a variety of different and interesting ecoregions. The following pages provide characteristics of the magnificent, but also increasingly endangered Hindu Kush-Himalayan region. PETR, T. (ed.) (1999): Fish and fisheries at higher altitudes. Asia. – FAO Fisheries Technical Paper 385. ALLAN, J.D. (1995): Stream Ecology. Structure and function of running waters. – Chapman & Hall. London. 388p. KADAMBARI SHARMA (ed.) (1999): Encyclopedia of Himalayas. Vol.1. Understanding Himalayas. – Anmol Publications PVT. LTD. New Delhi. 209p. CUSHING, C.E. & J.D. ALLAN (2001): Streams. Their Ecology and Life. – Academic Press. San Diego. 366p. METCALF AND EDDY (2000) Paper presented at a seminar on groundwater and waste water organised by Melamchi Water Supply Development Board, 14 th February 2000, Kathmandu, Nepal.